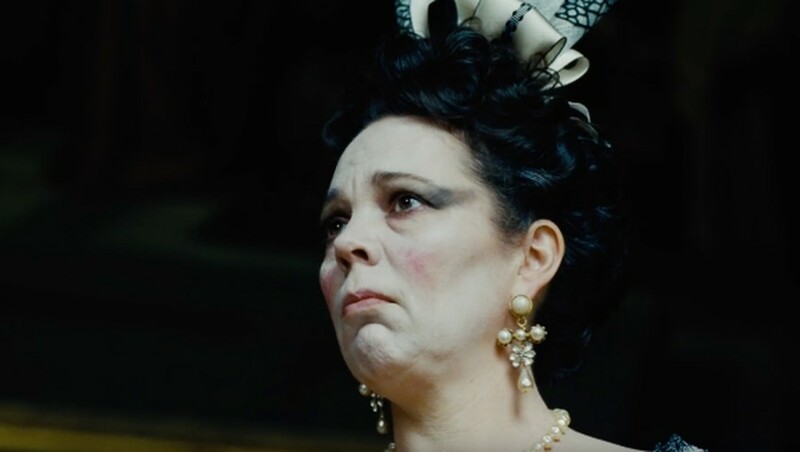 "The Favourite" received five Golden Globe Award Nominations, including Best Actress for Olivia Colman, who played Anne, Queen of Great Britain. Between the corsets and wigs, the accents and palatial setting, and the characters ripped straight from history, Yorgos Lanthimos’s The Favourite has all the trappings of a traditional period piece. Yet, Lanthimos and his cast are far more interested in subverting form than adhering to it. The film centers on Queen Anne (Olivia Colman) during her volatile and short-lived reign in Great Britain during the 18th century. As her nation wars with France and Spain, Anne cares far more about her 17 pet rabbits than her subjects, and she handles her illnesses and neuroses with the self-restraint of a child. At her side, Lady Sarah (Rachel Weisz) dutifully appeases Anne’s neediness, from rubbing her gout-inflicted legs to providing the approval Anne so desperately seeks. Exploiting the queen’s infirmities, Sarah, her most trusted confidante, has wormed her way into a position of power—and into the queen’s bed. Completing this political and sexual love triangle is Abigail Hill (Emma Stone), Sarah’s cousin. A former woman of status, Abigail appears at the palace covered in mud and desperate for employment from her unsympathetic cousin. By force of her charms, intelligence, and shrewdness, the wide-eyed Abigail quickly ascends from the scullery into the queen’s favor. What ensues is a delirious romp of manipulation, deceit, and cunning as Abigail and Sarah vie for the queen’s affections. While a real life Sarah and Abigail did exist, the aim of The Favourite is not historical accuracy. Rather, Lanthimos takes a historical footnote and creates a plot bursting with sabotage, sexual antics, wicked zingers, and sly social commentary. The Favourite showcases the absurdist elements, bleak morality, and ghastly humor that Lanthimos (The Lobster, The Killing of a Sacred Deer) is known for. But the script, written by Deborah Davis and Tony McNamara, balances these with believable and occasionally even sympathetic characters. Yes, there is a scene of a naked man being pelted with oranges by Parliament members, but grim moments such as these are superseded by the surprising humanity of Anne, Sarah, and Abigail. The film would not be possible without stellar performances, and Stone, Weisz, and Colman certainly deliver. The rivalry between Stone and Weisz is genuinely thrilling, continually re-defining itself through the fluctuating whims of Anne and the cool calculation of the competitors. The film purposely maintains the ambiguity of whom the audience should root for—at any given moment, Anne, Sarah, and Abigail display their concurrent strengths and weaknesses. Stone leans into Abigail’s posturing as an ingénue, a masquerade that effectively conceals her own dirty tactics and survival instincts. This is not to say that Stone never indulges in the whip-smart and vulgar dialogue. In her barbed one-liners, Stone relishes in their dryness and delivers them with the punchy directness of a heroine. Weisz, who has previously worked with Lanthimos in The Lobster, pairs Sarah’s thirst for power and brutal honesty with a disarming transparency. As Abigail threatens to replace her, Weisz displays an impressive duality: a woman embroiled in the internal conflict between preserving her position and her dignity. For fans of Lanthimos, The Favourite will certainly not disappoint, and the auteur director will likely usher in a whole new legion of converts with the film. He still utilizes some of the daring and unexpected filmmaking techniques of his earlier works—like the periodic use of a fishbowl lens and the confined setting—but this film is also his most accessible work. The film is also disconcertingly reflective. The palace teems with gossipy intrigue, arrogance, cruelty, and blatant selfishness. The characters and their flaws are eerily familiar, reflecting many of our current political figures. Everything—fortunes, worth, decisions, trust, alliances—is temporary, and affection is a mere method to obtain an end. It is an unsettling world, one that is simultaneously comic and brutish—and, perhaps, as unforgettable as our own.